In her debut novel, Swiss Vendetta, Tracee de Hahn introduced readers to a wonderfully unique new crime series character, Swiss-American police officer Agnes Luthi. Luthi is 38 years old, a recent widow, mother of two sons, lives with her parents-in-law (because of her job hours), and a fairly new member of the Violent Crimes unit. Although raised in Switzerland, Agnes Luthi was born to American parents, and so by the strict observances of the Swiss, she will never be considered quite one of them. But that doesn't prevent Agnes becoming an integral part of serving and protecting in the Swiss police. Tracee de Hahn has created a character that is an admirable one, a complex one and placed her in one of the world's most beautiful settings, Switzerland. It's a fresh look at crime, as this setting is definitely an underutilized font of rich storytelling. It is just three weeks after Agnes Luthi's case at the Vallotton estate in the first book, Swiss Vendetta. Agnes is three days away from returning to work after recuperating from her injuries suffered in that case when her former boss, Marcel Aubrey of the Financial Crimes division, asks her to witness the capture of a criminal she had pursued before her transfer to Violent Crimes. The scene is at the Messe Basel Exhibition Halles or Baselworld and leads to her encounter with Julien Vallotton from her previous case. 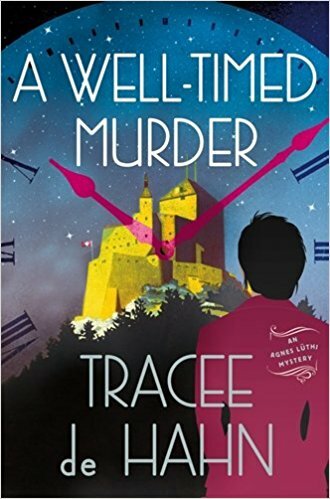 A friend of his has died, and the friend's daughter doesn't think it was an accident, so Julien asks Agnes to investigate. The friend, Guy Chavanon, was a well-known Swiss watchmaker, and Baselworld happened to be opening its yearly trade show for the revered art of watch making. Those involved in the Swiss specialty of Swiss-made are most proud and take the business of it most seriously, making it difficult for Agnes to infiltrate their barriers of secrecy and mistrust of outsiders. Guy Chavanon's death had been ruled an accident due to anaphylactic shock from exposure to peanuts, a deathly allergy for him. It happened at his son's exclusive boarding school where a roomful of parents, students, and teachers witnessed him collapse. Julien Vallotton is godfather to Guy Chavanon's son, as well as being on the board of directors at the school, so he is anxious for Agnes to uncover whether or not there is any basis to the daughter's suspicions. The starting point is, of course, the scene of the death, or crime, as it may be, and that is Moutier Institut de Jeunes Gens, a boarding school for boys only. It seems there are some questionable things going on at the school outside of the recent death, and soon Agnes is investigating a death and the peculiar events at the school. Her investigation of Chavanon's death takes her back and forth between the Baselworld trade show and the school. Swiss watchmaking is a high stakes, competitive industry, and Guy Chavanon had possibly been on the verge of an industry changing invention. There are those who would give anything to have such a invention, and there are also those who might want to prevent its inception. Helping to smooth the way for some of Agnes' interviews with these prickly professionals is Julien, who has a personal interest in Agnes, as well as his friend's death. The closeness Julien and Agnes experienced when she was investigating the death at his family estate, Chateau Vallotton is heating up for both of them. De Hahn's use of Julien in the investigation is not at all forced or contrived, but flows naturally into the course of events. Tracee de Hahn has a gift for writing a well-paced, thrilling, captivating story. Her style presents a smooth narrative through a deftness at handling language and sentence structuring to ensure a steady flow from page to page, chapter to chapter. The story is rather exclusive, a treat to something different in the crime/mystery world, as the setting so aptly provides access to this. The precise artistry of Swiss watchmaking proved a fascinating subject matter in which to place a murder. I'm particularly enjoying the setting of Switzerland because de Hahn brings in so much of the Swiss culture and history to the stories. Having lived in Switzerland for a time herself and married to a Swiss citizen lends much authenticity to this series. Who hasn't heard of Swiss chocolate and watches and banking, but to read about these icons of Swiss culture in a thrilling mystery/crime story truly presents a delightful learning experience as well as an amazing reading one. Adding this to my TBR! Great review! Thanks, Erica! I love the setting of this series.